RailClamp® is a low capacitance TVS array designed to protect high speed data interfaces. 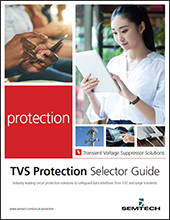 This series has been specifically designed to protect sensitive components which are connected to data and transmission lines from overvoltage caused by ESD (electrostatic discharge), CDE (Cable Discharge Events), and EFT(electrical fast transients). The complete datasheet for this product is restricted. To request a complete copy of this datasheet, please fill out our "Request for Information" form.